I am so with you when it comes to heights and ladders! I hate it! When we did our roof last year I did not like to get on the roof, but the worse part was getting down. It freaked me out. I'm glad I'm not the only one. 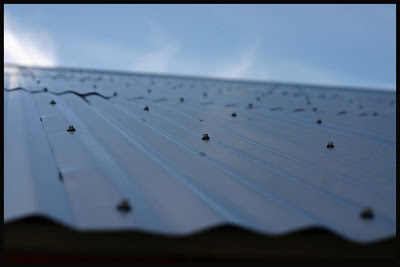 I love your roof, and how you kept track of how many screws you used. Looking good! This is so funny. I used to not be afraid of heights at all but I am becoming more of a wimp as of lately. I can't believe 11000 screws!!! Holy crap! Sure miss your kids tons. Can't wait to see you all. Love the tin roof, my favorite ice cream. Cat on a hot tin roof. Rain on a hot tine roof. No worries about the height issue. We all have our waterloos. Did you see me repeling of a 100 foot cliff. It was so cool.